ÜBERTHERM KNEE COLD COMPRESSION WRAP übertherm is the world's first thermally regulated cold therapy, delivering gradual, deeply penetrating cold that reaches the joints, muscles, and tendons without harmful freezing or the sting and burn of conventional ice packs. The übertherm Ice Pillow - the heart of all übertherm products - makes it possible. This unique layered pocket - a combination of carefully chosen insulating and conducting materials - holds the cooling pack comfortably against the skin and regulates the thermal transfer. The Ice Pillow's thermally calibrated healing technology slows the thermal transfer by roughly 80%, allowing the cold to penetrate gradually (and deeply) for a more comfortable experience. The cooling pack itself is a durable multi-chamber cold pack filled with a proprietary high-performance gel that retains cold for up to an hour, but stays semi-flexible even when frozen. When used in an übertherm Ice Pillow the cold doesn't drop below 34˚ F (1˚ C), providing therapeutic cold without the risk of ice-crystal induced cell injury. Cools evenly and gradually; promotes healing, relieves chronic pain, and eases inflammation. The wrap's high-grade neoprene material provides plenty of support as well as comfort against the skin. 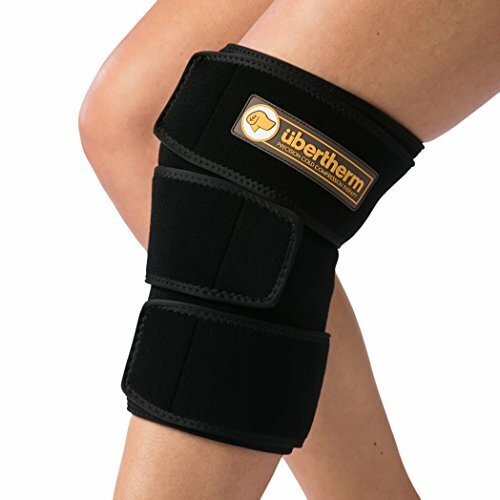 The übertherm Knee Cold Wrap is excellent for knee replacement pain, arthritis, fibromyalgia, osteoarthritis, runner's knee, ACL and meniscus injury, tendinitis, bursitis, and chronic inflammation. It's also perfect for post-exercise icing and post-op swelling. PHYSIOLOGIC DESIGN. übertherm cools without freezing, targeting the Goldilocks Zone of ideal pain and inflammation relief. Aggressive ice packs freeze damage your cells (frostbite spectrum) often prolonging inflammation and leaving muscles frozen and brittle. übertherm never cools you below 1˚C, for safe, soothing, and effective cold therapy. ICE PILLOW TECHNOLOGY. Unique thermal composite pocket holds the cooling pack comfortably against your skin while regulating the thermal transfer in a way no ordinary ice pack does. A unique, sting-free, physiologically targeted cold therapy experience. ULTRA LONG-LASTING. The übertherm cold gel pack has multiple chambers filled with a proprietary high-performance gel that retains cold for up to an hour but stays semi-flexible when frozen. COMFORT AND SUPPORT. Each übertherm knee compression wrap features the highest-grade neoprene material available and provides exceptional support and comfort, and an all-over Velcro closure that allows for a universal fit. Lasts for years. For use between activity and after physical therapy. EFFECTIVE THERAPY for the inflammation, swelling, and pain associated with knee replacement and arthroscopic surgery, meniscus and ACL injury, tendinitis, sprain, arthritis, runner's knee, and fibromyalgia. Soothing sports icing for athletes.